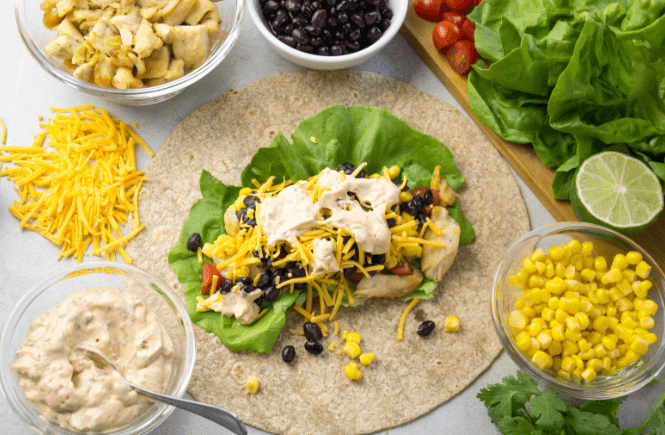 This Southwest Chicken Wrap is a tasty lunch made with Tyson® Grilled & Ready® Fully Cooked Oven Roasted Diced Chicken Breast, lettuce, tomato, beans, corn, cheese and a Skinny Chipotle Mayo wrapped in a whole wheat tortilla. After those high calorie holiday meals and extra sugary treats, I force myself make smarter food choices to start off the new year, as many people do. Lunchtime is my “make it or break it” part to my day. It is so easy to grab a soda and fast food mid-day, so it takes extra effort to plan out my lunches and stick to it. 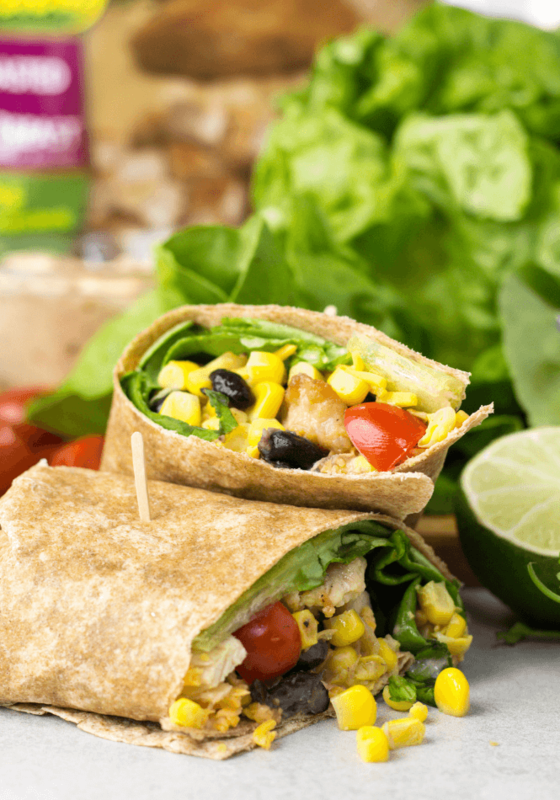 Having something tasty, wholesome, convenient, filling and better for me is the goal and this Southwest Chicken Wrap hits all the notes. Plus, I am hitting the gym more frequently so a high protein diet is a must! A delicious Southwest Chicken Wrap starts with quality chicken. Tyson Grilled & Ready chicken products can help simplify meal time by saving time and supplying protein. I find it in the freezer section at my local Walmart! 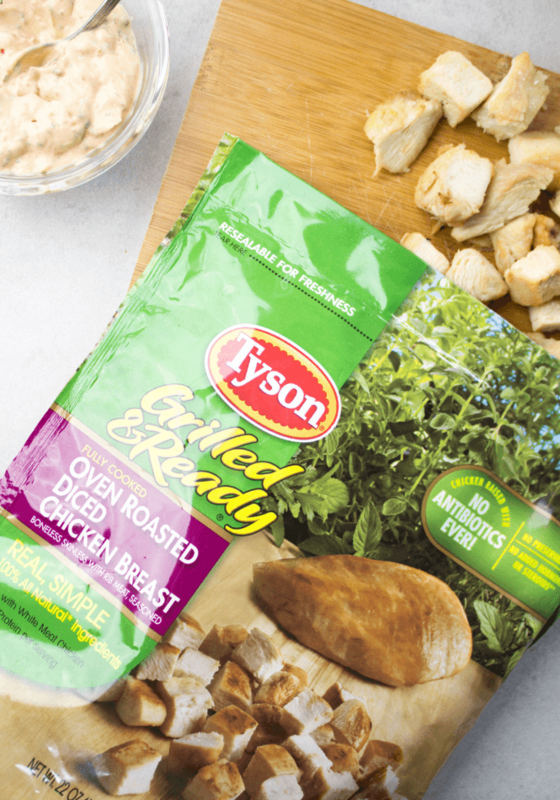 Tyson Grilled & Ready Fully Cooked Oven Roasted Diced Chicken Breast has 19g of protein per serving of its 100% all-natural, made with white meat chicken. No antibiotics are ever used! Also try the Tyson Grilled & Ready Fully Cooked Grilled Fajita Chicken Strips for some extra flavor and 17g of protein per serving! Save $1 on one Tyson Grilled & Ready product at Walmart with this Ibotta Rebate Offer. Offer good from 1/12/19 – 2/10/19! 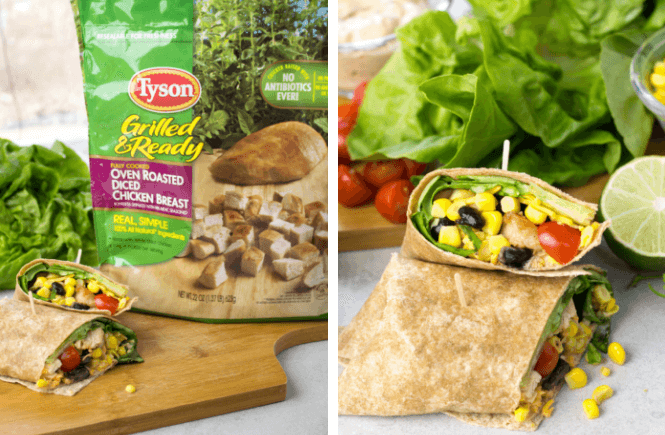 This Southwest Chicken Wrap is a breeze to make thanks to Tyson Grilled and Ready products. You can quickly heat the chicken up in the microwave or cook on the stove-top for 3-5 minutes. I like to add just a drizzle of olive oil to a hot pan, add the chicken with a pinch of salt and pepper and toss the chicken until re-heated. 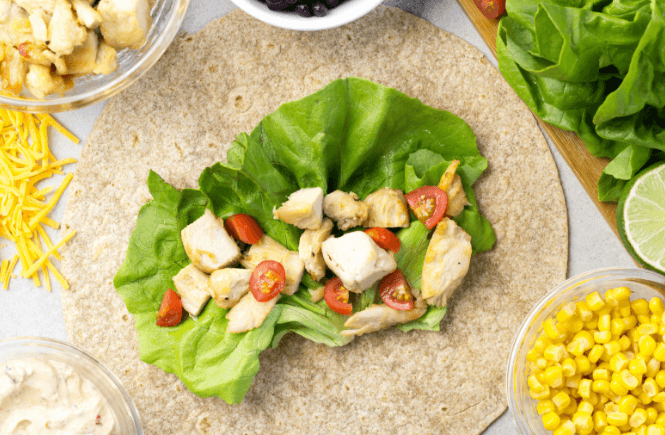 SO easy, SO fast and SO convenient for various meals- not just these yummy Southwest Chicken Wraps. The meal possibilities are endless! A good sandwich or wrap has a great sauce. A lot of sauces add a lot of fat/calories that I am trying to stay away from so this Skinny Chipotle Mayo is added to cut back a bit but still supply a lot of flavor. Place ingredients into a food processor and blend until creamy. Store in a sealable container in the fridge for one week. Use on sandwiches, wraps, salads, as a dip and more! I am getting hungry with all this Southwest Chicken Wrap and Skinny Chipotle Mayo talk. Time to get cooking because lunchtime is here. 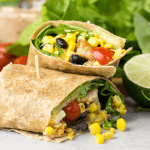 Southwest Chicken Wrap is a tasty lunch made with Tyson® Grilled & Ready® Fully Cooked Oven Roasted Diced Chicken Breast, lettuce, tomato, beans, corn, cheese and a skinny Chipotle mayo wrapped in a whole wheat tortilla. 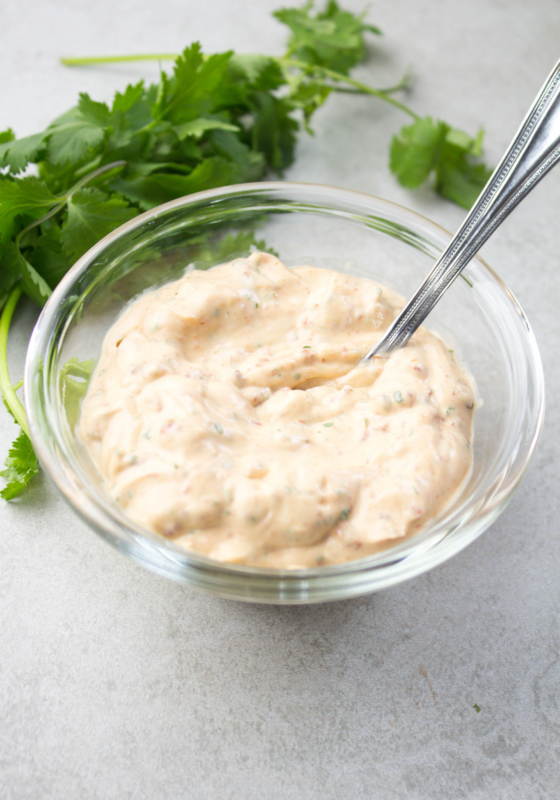 Make a batch of Skinny Chipotle Mayo by adding 1/2 cup mayonnaise, 1/4 cup Greek yogurt, 1 Tablespoon freshly squeezed lime juice, 2 Chipotle chiles from a can and 1 Tablespoon fresh cilantro into a food processor or blend. Blend for 1 minute and store in a sealed container in the fridge. On the stove on a medium-high heat, add 1/2 cup Tyson® Grilled & Ready® Fully Cooked Oven Roasted Diced Chicken Breasts to a hot pan with some olive oil. Add salt and pepper and toss often for 3-5 minutes to reheat chicken. Alternately, you can heat 1/2 cup Tyson® Grilled & Ready® Fully Cooked Oven Roasted Diced Chicken Breasts in the microwave for 1 minute. Wash the lettuce and cherry tomatoes. Drain the beans and corn if canned. Quarter the cherry tomatoes. 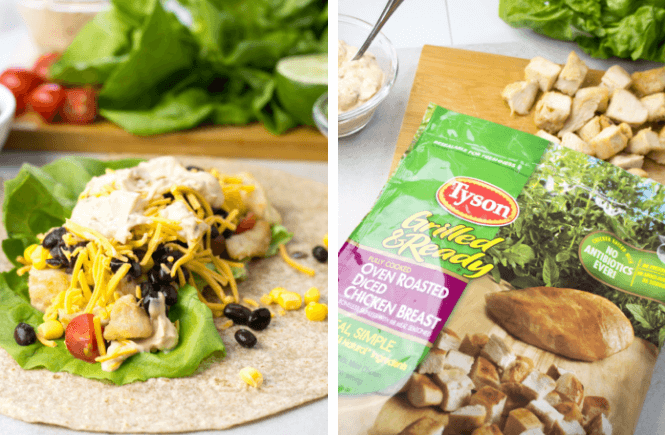 Place heated Tyson® Grilled & Ready® Fully Cooked Oven Roasted Diced Chicken Breasts, 1/2 cup lettuce, 1/4 cup corn, 1/4 cup black beans, tomatoes, 1/4 cup cheese and a tablespoon of the Skinny Chipotle Mayo lined in the center of a tortilla. Roll up the ingredients and serve. How do you plan on building smarter eating habits this year? Let me know in the comments below and tell me how Tyson Grilled & Ready products are going to help you out! These look super delicious, never thought to use already cook chicken. So will defiantly give it a try one time. I always feel like my wraps I make are so bland — this recipe is anything but! I love the convenience of the chicken already being cooked + thanks for the tip on the Ibotta rebate! Can’t wait to try! Nothing bland here Lexington and yes, so simple to toss together with the pre-cooked chicken so take advantage of that Ibotta offer! This sounds so good! I never thought to use the ready-to-use tyson chicken! I’m going to have to try this recipe! Such a perfect and easy lunch to whip up! Hmm yum! This Southwest Chicken Wrap looks soooo delicious. Can take a bite? You can have the whole wrap Maggie! These look so delicious and simple! The Tyson chicken makes this so easy Jodi and yes, delicious!